Hi the bulk tagging feature is really useful but I can’t find a maintain the reference on transactions. We make a lot of cash sales with money coming into a bank account I normally tag these to the income line that they correspond to. The narrative on the bank transactions included the name of the customer but if I use the bulk tagging function to tag a number of similar transactions they all appear on the income account with a common Description. It would be brilliant and save a huge amount of time if there were an option to simply have the reference from each transaction on the bank account transferred to the corresponding transaction generated in the ledger. Is this possible am I missing something? 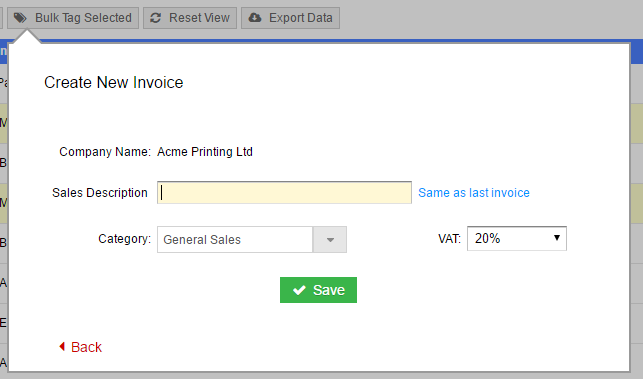 When bulk tagging multiple entries on the bank, currently we allow only a single common reference to be created for all the new invoices. Are you suggesting instead to have an option that would simply take the reference from the bank and apply individually to each corresponding invoice? It may be possible for us to add this feature, I just want to first make sure we’re on the same page.